The Blue River is a wonderful little steam located on the south side of the Kansas City metro area. The headwaters for the river is in Johnson County, Kansas, south of Olathe. The Blue starts out as two different streams, Coffee Creek and Wolf Creek. These 2 combine, south of Stanley, to form the Blue. From that point, the river heads north-east, combines with another stream, called the Camp Branch and then flows into the state of Missouri. It passes through Martin City and then heads north, skirting the east side of Kansas City. Major tributaries in Kansas City include Indian Creek and Brush Creek. The Blue continues north and then flows into the Missouri river. The purpose of this homepage is to provide a common community for the different groups and individuals who are interested in the welfare of the Blue. Conservation Organizations Several organizations support activities that benefit the Blue River. Blue River Watershed Association - seeks to improve the quality of the Blue River, its tributaries, and nearby streams through education and the development of comunity partnerships. BRWA sponsors several events and programs in the local area. KC Wildlands restores and manages the remnants of Kansas City’s original landscapeworks. They promote native plants and remove agressive invasive species. Heart of America Fly Fishers (HOAFF). The Fly Fishers are one of the local affiliates of the Federation of Flyfishers, an organization that promotes conservation and education through fly fishing. HOAFF has adopted 2 miles of the Blue River, from Indian Creek to Red Bridge Road, as part of the MO Stream Team Program. They sponsor river clean-ups every spring. The HOAFF is affiliated with the Southern Council Federation of Flyfishers , who have provided financial support for environmental causes on the Blue. Earth Riders Trails Association. This group develops and maintains trails for mountain biking and hiking in the parkland along the river, in Swope Park and along the Blue River Parkway in south Kansas City south of Red BridgeThey are also working on conector trails between Swope and BRP. Their web site contains maps and other general information about the trails. A special shout out to Rob Stitt and Zac Loehr for their efforts. Healthy Rivers Partnership is a general watershed conservation group that gets involved in many of the local waterways. Jackson County Parks and Recreation . 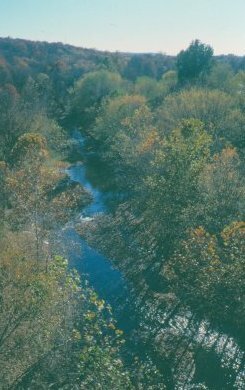 The parks deparment purchased most of the land along the Blue River, from Swope Park to the Kansas state line, in the 1950s and 1960s. Most of this land is maintained as an undeveloped park. They have their own programs to support the Blue. They also freely support many of the volunteer organizations listed on this page. The Wilderness Science Center is an educational facility created with the primary goal of providing authentic learning opportunities for the students of Blue Valley Schools. , which is a very cool program. The city of Overland Park has become very proactive in moderating the negative consequences of land development within it's borders. 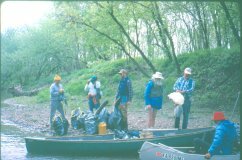 Ozark Wilderness Waterways Club OWWC has adopted several miles of the Blue River,from the KS/MO border to Red Bridge Road, as part of the MO Stream Team Program. The park land along Blue River and it's tributaries is undeveloped. There are plants that sting, critters that bite, and places where you can fall off of cliffs. The parks are next to populated areas, and not everyone has your best interest at heart. River levels can raise rapidly after a storm. Both Kansas City MO and Johnson County KS maintain buried sanitary sewers along the river. They do occasionally leak and sometimes a sewer gets plugged, and sewage overflows out of the nearest manhole upstream of the plug. The further downsteam the more likely their is a problem. The sewers do overflow during large storms when infiltration caused by the storm runoff exceeds the capacity of the sewer. It is best to stay out of the water for a few days after a big storm. If you see a problem with one of the sewers, call the local sewer department. In Kansas City, MO contact the Action cenetr ny calling 311 or 816.513.1313 or go to the Action Center website for more options. In Johnson County, call JOCO Wasterwater at 913.715.8600 or go to their website. End of the Blue, where it flows into the Missouri River, near I-435 and Front Street. The United States Geological Survey maintains stream gages at several locations along the Blue River and its tributaries.